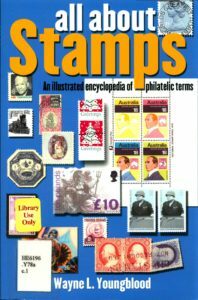 Here at the APRL there are a number of such resources that can assist in defining and in some cases even illustrating unfamiliar philatelic words or terminology. For the purposes of this column there are four notable resources that can assist any collector wishing to define certain terms. 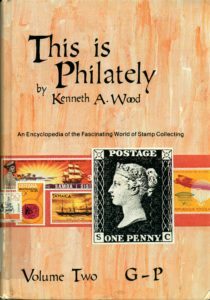 Published in 1982 “This is Philately” (HE6196 .W876t), a three-volume 878 page encyclopedia by Kenneth Wood, is one of the most comprehensive and accessible compilations of philatelic terms and their definitions for both the beginner and the experienced collector. 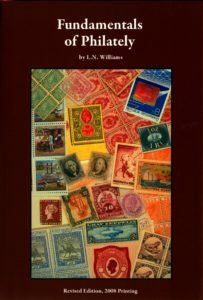 Wood’s work includes definitions of philatelic terms and subjects as well as geographic and historic terminology related to philately. For purely philatelic terminology and their definitions, there are two useful resources worth consulting. 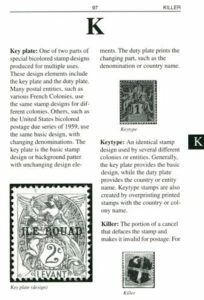 “All About Stamps: An Illustrated Encyclopedia of Philatelic Terms” by Wayne Youngblood (HE6196 .Y78a) provides thorough introductions, often with illustrations, to many of the more familiar philatelic words used in collecting, while L. N. Williams’ landmark work “Fundamentals of Philately” (HE6213 .W724f ) provides detailed descriptions, definitions and photographs of the most common and highly technical philatelic terminology. In twelve of the fourteen chapters in Williams’ book he includes a section titled “Related Terms Defined” which provides detailed definitions for specific terms used in each of those chapters. Finally, for international terms and terminology that U.S. collectors especially may not be aware of, there is the very resourceful book by R. Scott Carlton titled “The International Encyclopaedic Dictionary of Philatelics.” (HE6196 .C285i) In his dictionary Carlton covers philatelic terms alphabetically in English, modern Greek, Russian and Hebrew. 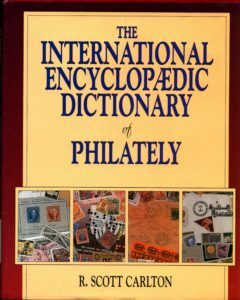 After the extensive dictionary that begins the book a multi-language series of tables is appended in which translations of English philatelic terms are listed in twenty different languages including German, French, Portuguese, Italian, Spanish, Asian languages, Scandinavian languages and Russian. These four works are just a few of the dictionaries and encyclopedias that members can borrow and collectors may reference when contacting the APRL. For any further information regarding the works described here or others, feel free to contact the APRL at library@stamps.org. The Stamp Collector’s Encyclopaedia by R. J. Sutton (1966). I have heard that back in the 1800’s someone wallpapered her wall with real Penny Black stamps. Did this rally happen? Or was someone telling me a fairy tale?